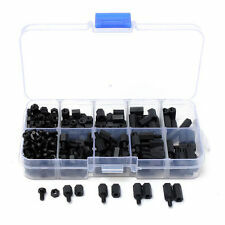 Color: Black Material: Nylon Brand New and High Quality Type specification complete, the quality is reliable Packed in a plastic box Package Included: 1X 300pcs M3 Hex Spacers Screw Note:Light shooting and different displays may cause the color of the item in the picture a little different from the real thing. The measurement allowed error is /-1-3cm. Brand Unbranded MPN Does not apply UPC 190268182980. Thread Size: 4-40. Plating: Nickel. Material: Brass. Canada:If your package is less than 2cm thick and less than 200gr, your shipping cost is $4. New by RAF Electronic Hardware. Fast. Simple. I am sorry but I do not ship via ANY other method besides Canada Post and USPS. USA buyers:Shipping times for most of the items we send into the USA have been averaging 2 weeks. 50 Pcs Brass Screw PCB Standoffs Hexagonal Spacers M3 Male x M3 Female 5mm Length quoted is hexagonal spacer length, the hexagon does not skid easily. Fix between PC board and machine board. Brand Unbranded MPN Does not apply UPC 4894462040492 EAN Does not apply EAN Does not apply. Trending at C $2.41eBay determines this price through a machine-learned model of the product's sale prices within the last 90 days. 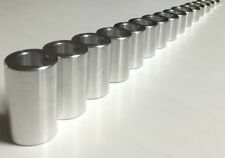 50 Pcs M3 Male x M3 Female Hex Head PCB Standoffs Spacers 12mm Length Length quoted is hexagonal spacer length, the hexagon does not skid easily. Fix between PC board and machine board. Total length：12mm Brand Unbranded MPN Does not Apply UPC 4894462040508. 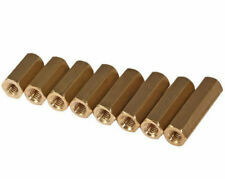 Description:Tough and durable, brass spacers are useful for many applications. 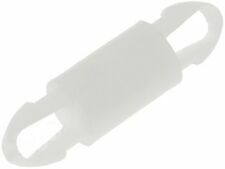 They are ideal for use in electrical and electronic assemblies. 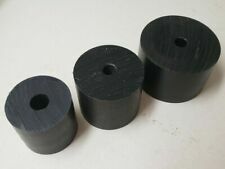 They also can be used as bushings, bearing, rollers, and glides. 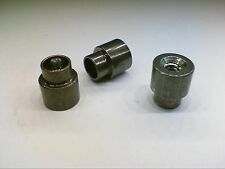 Specifications:Product Name: Round Standoff SpacerInner Diameter: M2Outer Diameter: 3mm / 0.12-inchTotal Length:21mm / 0.83-inchMaterial: BrassColor: Gold ToneNet Weight: 18gPackage Content: 50( /-2%)pcs x Round Standoff Spacer. 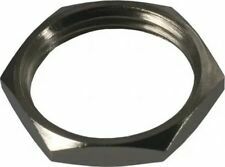 Size:M3 30mm (Length L = 30mm). Qty: 25 pcs. 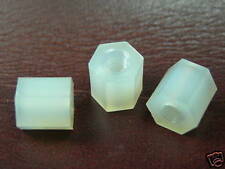 Nylon Spacers Standoffs. Part: HTS-330. United States. 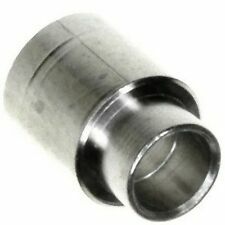 Product Name : Brass Pillars Standoff; Thread Size : M2 Male x M2 Female Male Thread Length : 3mm/ 0.12"; Body Length : 6mm/ 0.24" Total Size(Approx.) 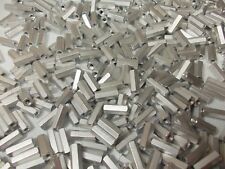 : 9 x 3mm/ 0.35" x 0.12" (L*Max.